As you know, I don't tend to watch very much TV these days - currently, I only make sure I keep up with MasterChef (now in its finals week, and we sadly saw the end of Lindsay's journey in the competition on Monday last week), Doctor Who, and MLP:FiM. But, I do have a substantial pile of TV and film I'd like to catch up with, and I finally got around to all of Steven Universe recently - and I'm delighted I did. ^_^ I think, at its core, it's its emotional richness that appeals, alongside its remarkable use of music, both in incidental work, with some occasional chiptune sensibilities, and even a few (all too infrequent!) musical numbers, such as Stronger Than You, which begins somehow hip-hop before gliding into a more funky style, or the broody, melancholic It's Over, Isn't It? - even the first ending theme, the gently beautiful Love Like You they eked out over the course of a couple seasons, giving subtly different versions each time; someone's kindly edited it all together into a complete piece here. (And it's the show's creator playing the piano and providing vocals!) Its positivity toward love, regardless of gender, is a delightful aspect; it's quite open that Pearl was very much in love with Rose - indeed, It's Over is a poignant tribute to that. If you'd like to give it a try, it's probably all on YouTube, but I found it more convenient to snag it from Yay Steven; the torrents seem to be quite well seeded, thankfully. On rather a different TV note, the gigantic news has to be that Dredd is coming to TV: Rebellion's announced they're developing a Megacity One TV series. =:D They have writers lined up (what an opportunity! ), but casting's yet to be completed. Obviously, I'd love to see Karl Urban return to the role, but he may be too expensive - but who knows? Maybe it's a role he'd take for the fun of it. I wonder how it'll wind up being distributed - Netflix, maybe? Much as I'd love to see the BBC pick it up, they really don't seem positively inclined toward sci-fi, and only slightly more toward fantasy, with Doctor Who being about the only exception that comes immediately to mind. So, we just saw these folk play: 3 Daft Monkeys. Ye gods, such energy! I'd see them again immediately if that were an option, but they're touring around, departing immediately. As the venue's blurb put it: "With their quirky and original approach to music, and their passion, intensity and sheer joy of life, 3 Daft Monkeys have gained themselves a large and loyal cult following. Their music is hard to pigeon-hole, mixing and crossing many musical genres from Celtic, Klezmer, Gypsy, Balkan, Latin, Ska, Dub Reggae, Indie, Rock and even a hint of Shostakovich." 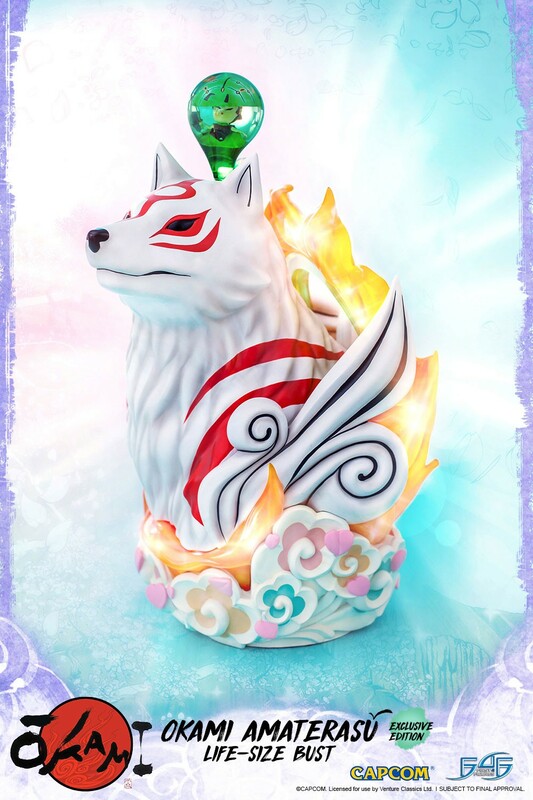 If you're a big fan of Okami, how about a life-size bust of Amaterasu? Sadly, it's only a two minute trailer, for a show pitch that apparently hasn't gone anywhere yet, but it's huge fun regardless: Super Turbo Atomic Ninja Rabbit. On board Japan's new luxury train, running between Tokyo and Hokkaido, with space for 34 passengers between the ten cars. Food is, of course, prepared by Michelin-starred chefs, and delivered by uniformed butlers. With tickets ranging from $2860 to around $10k, it's fully booked until March 2018. Reaction Engines has begun construction of their test facility, with the first SABRE core testing scheduled for 2020. I seriously want to be there to witness that first test, one way or another. SpaceX is doing very good work, but the tech is essentially purely evolutionary - SABRE has the potential to open up new frontiers of both hypersonic passenger travel and space launches. Behold: one of the greatest musical and cultural meldings ever attempted, and attained - Princess Leia's Stolen Death Star Plans. I've used images rather than YouTube embeds, as those seem quite demanding on lower powered devices. I'm going to pretend I didn't see the Amaterasu bust. Lucky it's not Chibiterasu or I'd already have pressed the button. I'm not actually sure how new/old those tracks are.. hm, indeed, the upload date suggests they're hot off the mixing desk. ^_^ And of course, it's even more impressive that they've not only come up with a full album, but also accompanying videos as well. =:D I do hope Lucasfilm/Disney let it slide, in the name of artistic homage - hell, give them a license and take a cut! Do you get up to any home brewing, I wonder? Apparently the Ninja Rabbit is, or could be, a fake, at least according to some sites I visited (like this one https://www.vice.com/en_us/article/super-turbo-atomic-ninja-rabbit-interview). The intro has that 80's (they say 90's) feel, and some soul even put up a 'VHS' copy of all he could salvage of the beginning... Nicely drawn bunny, though. Cheap liquor, eh? Reminds me of my son rolling his own smokes. And thinking of him I'll relay the dafts along.